The man who will be probably known for his imagination for generation departs leaving behind a priceless legacy. 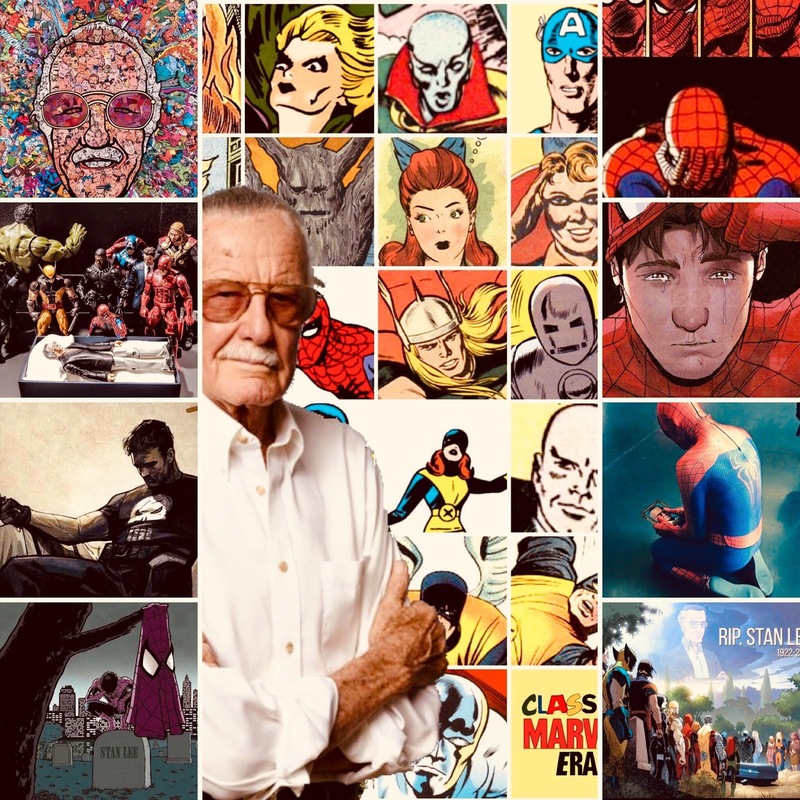 Stan Lee - the co-creator of Spider-man, Hulk, Doctor Strange, Iron Man, Black Panther, Ant-Man, the X-Men, Thor, and 100 other superheroes and villains is one of the greatest comic book writers of our time. The characters created by him are immortalized through live-action movies, TV series, and video games. 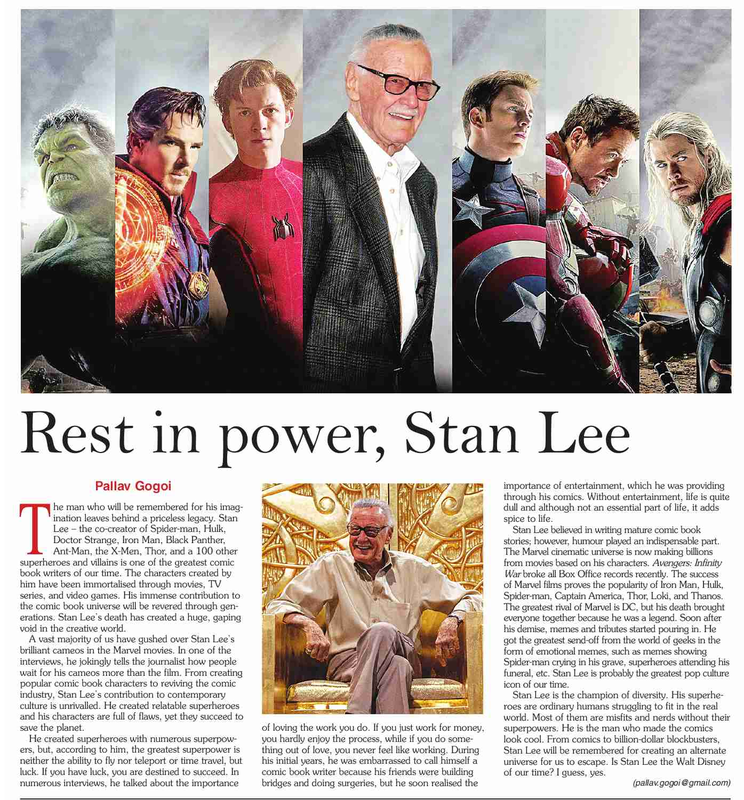 His immense contribution to the comic book universe will be revered through generations. Stan Lee's death created the biggest void in the creative world. We all adore Stan Lee's brilliant cameos in the Marvel Movies. In one of the interviews, he jokingly tells the journalist how people wait for his cameos more than the film. From creating popular comic book characters to reviving the comic industry, Stan Lee's contribution to contemporary culture is just unrivaled. He created superheroes with whom you can relate to. His characters are full of flaws yet they succeed to save the planet. He created various superheroes with numerous superpowers but according to him, the greatest superpower is neither the ability to fly nor teleport or time travel, according to him, the greatest superpower is Luck. If you have luck, you are destined to succeed. In numerous interviews, he told the importance of loving the work you do. If you just do your work for money, you hardly enjoy the process while if you do something out of love, you never feel like working. It’s always a playtime. During his initial years, he was embarrassed to call himself as comic book writer because his friends were building bridges and doing surgeries, but he soon realized the importance of entertainment, which he was providing through his comics. Without entertainment, life is quite dull and it’s something without which you can’t live. Stan Lee believed in writing matured comic book stories however humor played an indispensable part. Marvel Cinematic Universe is now making billions from movies based on his characters. Avengers: Infinity War broke all BO records recently. The success of Marvel films proves the popularity of Iron Man, Hulk, Spider-man, Captain America, Thor, Loki, and Thanos. The greatest rival of Marvel is DC, but his death brought everyone together because he was a legend. Soon after his demise, memes and tributes started pouring in. He got the greatest send-off from the world of geeks in the form of emotional memes. Memes showing Spiderman crying in his grave, superheroes attending his funeral etc. Stan Lee is probably the greatest pop culture icon of our time. Stan Lee is the champion of diversity. His superheroes are ordinary humans struggling to fit in the real world. Most of them are misfits and nerds without their superpower. He is the man who made the comics look cool. From comics to billion-dollar blockbusters, Stan Lee will be remembered for creating an alternate universe for us to escape. Is Stan Lee the Walt Disney of our time? I guess yes.